Rising gas prices may not have lifted all alt-fuel vehicles last month, but they did a pretty good job for some of the higher profile models. Overall, U.S. March sales of hybrids, extended-range plug-in hybrids, battery-electrics and diesels jumped about 40 percent from a year earlier as both the Toyota Prius hybrid and Chevrolet Volt extended-range plug-in set all-time monthly sales records. One possibility for the surge is that U.S. customers, beaten down by rising gas prices last year, are now willing to spend the extra money for more fuel-efficient, advanced-powertrain vehicles as gas prices continue to rise. 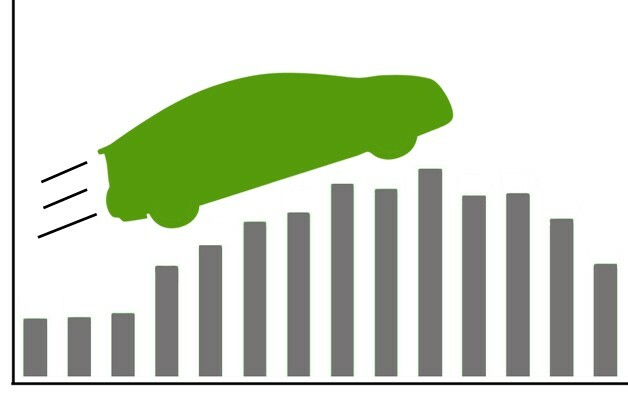 The sales surge was led, of course, by the Prius. The sales surge was led, of course, by the Prius, which moved 28,711 vehicles, up 54 percent from a year earlier. Toyota, in fact, set an all-time U.S. monthly sales record for the Prius, which was introduced here in 2000. Fueling the increase was a combination of a broader range of models – the Prius C compact and Prius V wagon both debuted in the U.S. this year – and 2011 sales figures that were held down by supply constraints stemming from the earthquake and ensuing tsunami that struck Japan last March. Meanwhile, sales of Toyota’s non-Prius vehicles, including the Camry and Highlander, jumped 61 percent from a year earlier to 6,011 vehicles. And, while Toyota didn’t break out Camry Hybrid sales, the Camry’s overall sales jumped 35 percent from a year earlier to a March-record 42,567 vehicles, hinting that the updated Camry Hybrid that was introduced late last year has been well-received. Sales of hybrids under Toyota’s Lexus luxury badge were up 5.8 percent. As for the Volt, General Motors sold 2,289 units last month, more than triple the Volt’s year-earlier sales and beating previous monthly record from December 2011 of 1,529 Volts. With such record sales, GM may shorten the five-week Volt shutdown that started March 19 by a week, and the automaker made good on former GM Vice Chairman Bob Lutz’s prediction last month that March would mark record sales for the model. In fact, when factoring in the estimated 2,500 Buick LaCrosses, Buick Regals and Chevrolet Malibus sold with the eAssist mild hybrid powertrains, GM sold almost 4,800 hybrids and plug-in hybrids in March. That’s more than the hybrids sold by Ford and Honda combined. While Nissan Leaf battery-electric vehicle sales weren’t as gaudy, they still almost doubled from a year earlier to 579 units. While Nissan Leaf battery-electric vehicle sales weren’t as gaudy, they still almost doubled from a year earlier to 579 units, and were also up from 478 Leafs in February. Additionally, in the smaller victories department, Mitsubishi sold 52 of its i battery-electric vehicles, beating the previous monthly record in February of 44 vehicles, while sales of Porsche’s Cayenne and Panamera Hybrids jumped a combined 46 percent from a year earlier to 167 vehicles. Since late last year, the average price of regular gas has jumped almost another 60 cents a gallon and is approaching the $4 mark, according to AAA. Determining how much such gas prices drove up alt-fuel vehicle sales is tough to determine because makers of smaller-production hybrids such as BMW and Mercedes-Benz don’t break out hybrid numbers, and Audi didn’t break out diesel sales a year ago. Motorized Utility Carts | Electric Cars For Sale | Are YOU Looking for ELECTRIC CARS FOR SALE? Here's MOTOR SCOOTERS FOR SALE information for you! Club Car Golf Cart Cover | Electric Cars For Sale | Are YOU Looking for ELECTRIC CARS FOR SALE? Here's MOTOR SCOOTERS FOR SALE information for you!